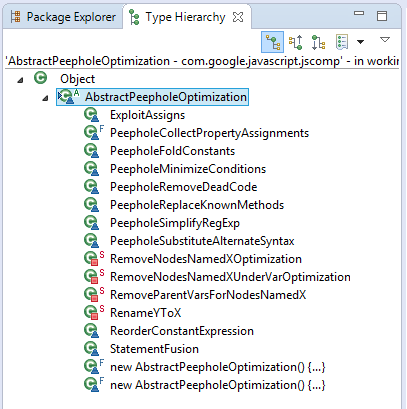 As part of the series exploring the internals of Google Closure Compiler, this time we are diving into one of the many optimizations that it does, the peephole optimization. optimizations that look at a small section of code and either remove that code (if it is not needed) or replaces it with smaller code. In compiler theory, peephole optimization is a kind of optimization performed over a very small set of instructions in a segment of generated code. The set is called a > "peephole" or a "window". It works by recognising sets of instructions that can be replaced by shorter or faster sets of instructions. And it's easy to verify so! This is a particular kind of peephole optimization that known as "contant folding", which has an entire wiki page dedicated. Constant folding is the process of recognizing and evaluating constant expressions at compile time rather than computing them at runtime. It's about getting results event before running any code! I think of it as being similar to static typing, where you can prove correctness without running the code. fold "abc" + "def" to "abcdef"
var z = 0 * 10; gets compiled to var z = 0. And, probably unsurprisingly, var s = "abc" + "def" gets compiled to var s = "abcdefg". A more advanced optimization is Constant Propagation. This is when values of expressions are known during the compilation stage, because they are constant, and can be substituted. However to get this using the closure compiler, you have to turn on advanced optimizations, the instructions are here. If you tried this and got and empty file, chances are that the compiler eliminated all code in the dead code elimination pass, where unused code is just thrown away. This is another compilation pass that is enabled when you turn on advanced optimizations. and you should see, console.log(20). Pretty crazy optimizations huh? When I first saw this example, I was thinking to myself, would people even write such code? And almost immediately I realized that I was guilty of this! This makes the 5 extremely obvious. It's nice knowing that it will be compiled down to SECONDS_IN_DAY=86400.